These are the goals of MED-DESIRE (MEDiterranean DEvelopment of Support Schemes for Solar Initiatives and Renewable Energies), a strategic project, cofounded by the European Union within the ENPI CBC Mediterranean Sea Basin Programme 2007-2013, aiming at fostering the energy efficiency and removing the cultural and technological barriers to the uptake of the distributed solar energy technologies within the Mediterranean Area. During the final conference “The sun for you: sustainable energy for the Mediterranean”, held in Rome on December 18th, the main project results have been presented by the partnership, composed by 9 institutional bodies from 5 countries (Egypt, Lebanon, Italy, Spain, Tunisia), leaded by Puglia Region – Department for Economic Development, Innovation, Education, Training and Employment - Industrial Research and Innovation Office and ARTI - Puglia regional Agency for Technology and Innovation (Puglia Region project implementing agency): the Egyptian New and Renewable Energy Authority; the Lebanese Center for Energy Conservation; the Italian Ministry for the Environment, Land and Sea; the Italian National Agency for New Technologies, Energy and Sustainable Economic Development; the Andalusian Energy Agency; the Andalusian Institute of Technology; the Center of Energetic, Environmental and Technological Investigations - Solar Platform of Almeria; the Tunisian National Agency for Energy Conservation. Improving the quality of distributed solar plants is very important. For this reason, MED DESIRE supported the adoption of new technical standards and the empowerment of local certification and testing laboratories, through “capacity building” initiatives and feasibility studies and promoted the quality of solar installations, training professionals and installers and the qualification of technical trainers in vocational schools. In order to reach the previous objective, MED-DESIRE project realized: 10 pilot training courses - 4 on distributed solar technologies, addressed to vocational school trainers (in Egypt, Lebanon, Tunisia) and to energy technicians and professionals in Italy (Puglia); 3 on solar ordinances in Egypt, Tunisia and Lebanon and 3 on new financial mechanisms in Egypt, Tunisia and Lebanon; 5 capacity building initiatives - 2 study visits to 3 ENEA laboratories in Italy addressed to Tunisian, Egyptian and Lebanese groups of experts; 3 workshops entitled “The quality supply chain of solar photovoltaic” in Egypt, Lebanon and Tunisia; 12 technical missions in the Mediterranean Partner Countries with local stakeholders. 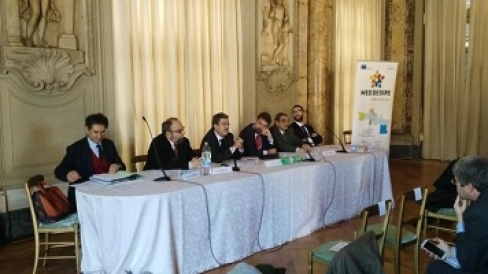 The event was organized by Puglia Region – Department for Economic Development, Innovation, Education, Training and Employment - Industrial Research and Innovation Office (Project Leader) and ARTI, in collaboration with all project partners.